Are you bored yet with all these pendants? I know I am not :) They are certainly making my days much brighter and more colorful. Today I played with a monogram with pink roses and then with a red rose with a couple of buds. 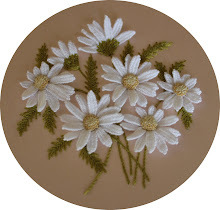 The daisy wreath is growing, too, only slower than planned, as it is a bit hard to see the white thread on cream silk fabric on these short, cloudy days. But the sun will have to come out eventually and until then, a couple of petals a day will have to do. 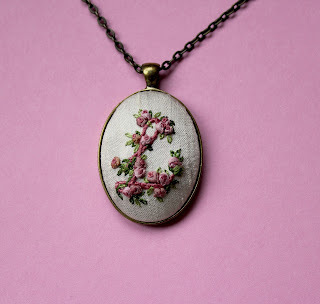 It has become more than clear that you really like those pendants!!! Nagyon szépek a medálok is, meg a crazy -s dolgaid is .Figyelem ám, ha nem is írok :)))Gratulálok a tehetségedhez ! Todo o seu trabalho com fitas é delicado e suave... estou curiosa para ver as margaridas. No, I'm not bored with your pendants. They are pretty, every one of them. Do you make them for presents? Én egyáltalán nem unom! Eszméletlenül szépek amiket csinálsz. A tarsolyomban nekem is van pár medál amit tavaly rendeltem, majd egyszer elkészül az enyém is. Csak mindig ezer dolgot szeretnék egyszerre. Csodásak ezek is. Alig várom, dehogy únom, hogy újabbat mutass! Dera Manya! It's a wonderfull work Congratulations ! Adorable ribbon roses! Great work! They are all delightful. The pendants and the hearts. Lovely work. We are never bored when we visit here! You could stitch on some old garbage bags and make them beautiful and we would come by to see them! 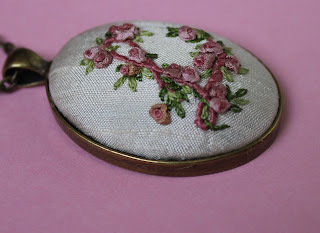 These are truly lovely and so very dainty a real keepsake. You just keep stitching and we will keep visiting! Never boring... Just beautiful work you love to make them and it shows... sell them! !